This strip comes from the second round of 15 that were originally posted on the YakFace.com forums. 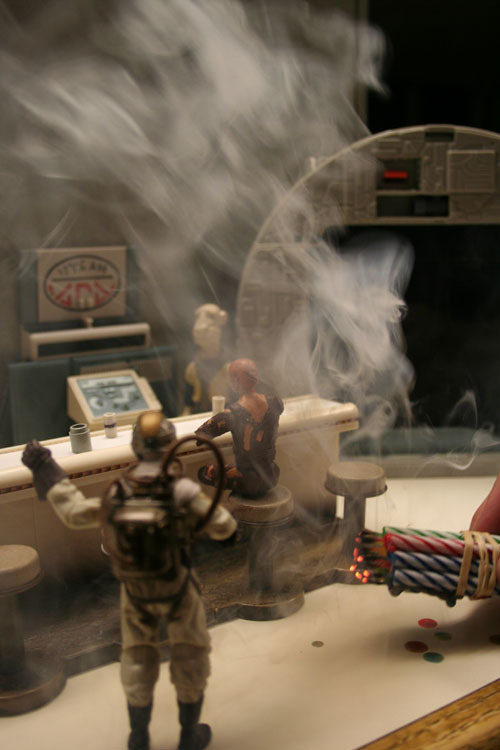 Here we had a fun experiment in practical effects. I needed smoke and did not have Photoshop. So… I made smoke, with fire! All in all, I took 52 shots for this and still have every one of them. Image 3 below is the one used for creating the original strip. 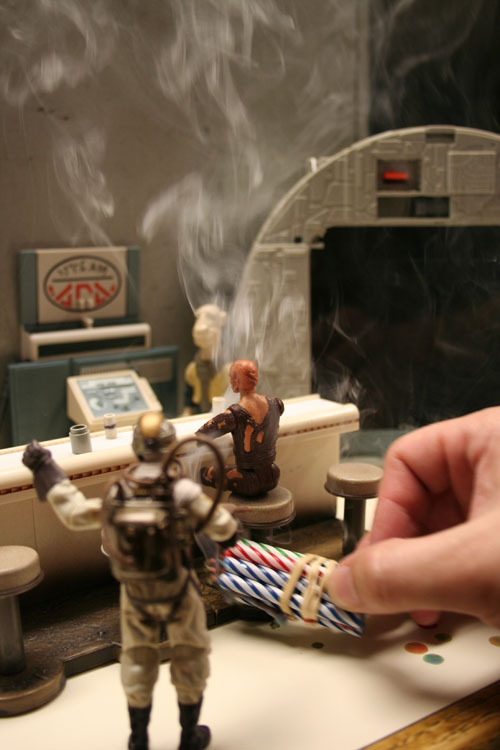 I remember selecting it because of how the smoke is curling around Anakin’s left arm. Image 4 was my choice for today’s remake. I went with this one because it’s actually a much cleaner image and Anakin looks far more toasty in my opinion. I went into this strip considering a reshoot. However, two major factors played into not doing so. 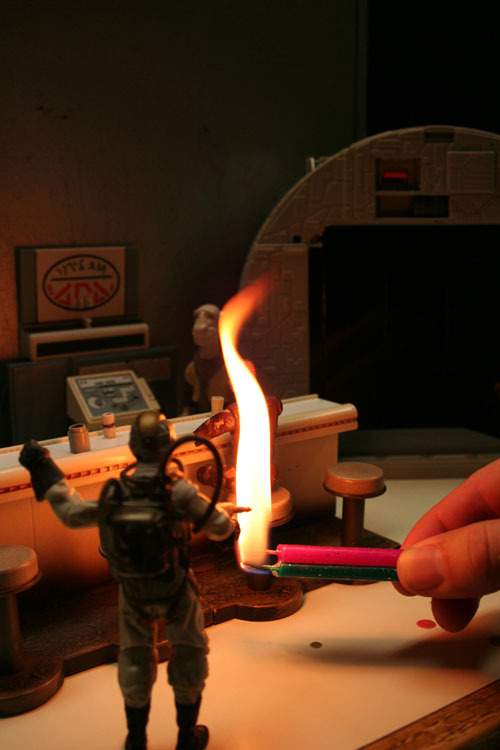 First, my studio is now located in my Star Wars room… there is NO WAY I’m lighting anything on fire in here. 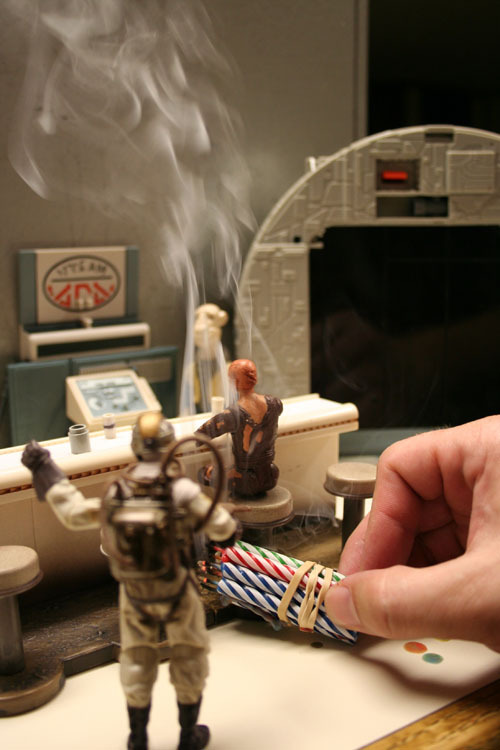 Back in 2006, Yak’s Pub was shot on my kitchen counter so all I had to do was turn on the oven fan to evacuate the smoke… not a possibility in the Star Wars room today and I’m not packing the whole set up to relocate for just one shot. Second, after sifting through all 52 original shots… there are some pretty good ones in there. I was actually quit pleased with a good number of them and the photography has stood the test of time on this one. It would be tough to pull it off again and I just don’t feel like putting fake smoke with Photoshop when I’ve got the real deal already there. Updates include: color correction, brightness adjustments, better speech bubble, and less intrusive copyright bug. Thanks! My original plan for the relaunch of Yak’s Pub was to just do updates to most of the original strips but then I got the idea for Imperial Incidents and well… you see where we are now. It’s fun reliving and sharing what went into making them back then.